Our house, Hampoland, is a comfortable mess. A strange, unorthodox home that’s served as a sanctuary not only for our four children, but for many of their friends, kids, stray dogs and young adults, who have sometimes needed a safe and happy refuge from the world. Structurally, it’s miraculous the house still stands. Walls are cracked, so we spackle and paint. The floors rise and fall with the seasons. The answer…more throw rugs. 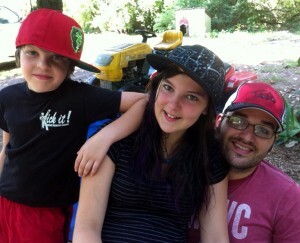 Hampoland, is a five acre redneck homestead, our youngest daughter, Lex, who is 22, compares to a Dr. Seuss “Who House”. This morning, I realized what I’ve known for years. 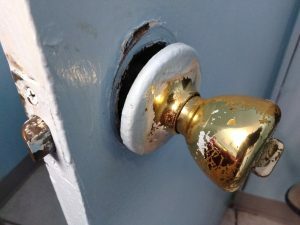 Most of the doors in our house can’t be fully closed and most of the door knobs are splattered with paint and are a rattling, jacked up mess. Our knobs are unable to fully close and lock any interior door in the house, much less keep it secured. They are loose and jangle in their holes, incapable of keeping anything inside or outside a room. Our doors can be pulled closed, then just as easily pushed open. Years ago, we could have replaced all these useless door knobs, I suppose. But it never seemed important. New furniture has been moved in and out, cars have been bought and sold, kids have headed off to college, graduated and started their lives. But replacing the ten dollar door knobs was never a priority. In this house, doors can’t really be closed. Push just a little and you’ll always be able to get in. And maybe that’s a good thing. So, when Alex and I die and this house is demolished, I hope each of our children will take a trashed and useless Hampoland doorknob. Because, when there is love, doors can always be opened. Then one day she started her “possessed by a demon” act and I pulled my camera out right there in the parking lot and took a picture, with the flash. She was shocked into silence for a second and then continued with only half the passion. The next time she melted down I just smiled. She slowed down then tried to come back even louder. I started laughing. Then she got really mad, I kept on smiling and laughing as I put the groceries in the car. She continued wailing, then downgraded to a snivel and finally cried softly as I put her in her car seat. Then she was silent. She had been defeated!! I have used that exact same method over and over for the past twenty seven years on kids who were two, ten, thirteen and sixteen. It still works…most of the time. 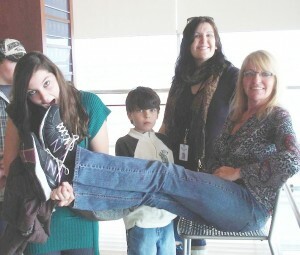 Do not let your kid bully, trick or coheres you into giving in. You are the parent. Sandor loves to ride his dirt bike on Sunday afternoons. He waits all week for his three hours on that bike. A couple of weeks ago I told him he had to put his clean clothes away (in the appropriate drawers, not crammed into one) and clean up his room before we would leave. Thirty minutes latter he said he was finished but that was not true. His room was still a mess, the bed was made but it looked like there was a bear sleeping in it. His floor was still littered with legos, drum sticks and junk. “Nope.” At that point some kids will melt down, throw a fit and get mad. THAT’S OK! Let them self destruct but don’t react. Just walk away and take a nice long shower. Eventually, like Mary in the shopping cart, they will realize that button doesn’t work anymore. And if he misses riding his dirt bike this week, he’ll probably get his room clean next week. “Please Mom?” Sandor said. I just shook my head, kind of hugged him and smiled. He knew it was a classic case of Hampoland’s “yes for a yes” policy. When you say yes to me, I’ll say yes to you and we’re both happy. Kids are smart, they know how to get to you, they will keep doing what works in to get what they want. And they know if you don’t stick to your guns they will win every time. Either you have to train them or they are training you. So you have to stand firm, but it’s a whole lot easier and more effective if you don’t get mad, sad and frustrated. If you do that, you’re punishing yourself….and that’s not the point. You just want to make your kid do right. One more thought, take control as soon as possible cause when they get older things will get a lot worse. One of the most befuddling questions I hear every week….”so what’s your blog about?” or “what do you write about?” Yikes, that’s tough, I should know what I write about but I don’t. I should have an ‘elevator description’ for Hampoland, something short, to the point, accurate and endlessly witty. I got nothing. If you look at the counter at the bottom of the page you’ll see there have almost been one million hits. I’m astonished and grateful but I still don’t know what it is I’m writing about. My standard answer is “I’m almost brilliant….fifty percent of the time”. But that’s not really an answer, just a flip rebuttal. For the last two weeks I’ve been talking a great deal about my dad, I. Granger McDaniel, a visionary, a war hero, a miracle man. And while I was talking and talking and writing and writing I think I discovered a couple of my themes. I learned them from him. 1. Happiness is a choice you have to make every morning. It’s not something that arrives or is given to you by somebody else. Look around you, see your world, see the magic and love it. 2. With faith and hard work anything is possible. Happiness is possible, love is possible, magic is possible. But you have to have faith and work hard. 3. Always put your family first. From the begining and in the end that’s what matters. PS I’m putting my family first by posting this link. It’s my son, Jack, and his band. Send them twenty dollars please. if you send them 100 they will write you a song! Comments Off on What The Hell Am I Talking About? If you ever visit Hampoland and ask for a drink you’ll probably be handed a beautiful- tacky- coffee mug. Doesn’t matter if you ask for water, wine, coffee, juice or milk, chances are you’ll be drinking out of a coffee mug. 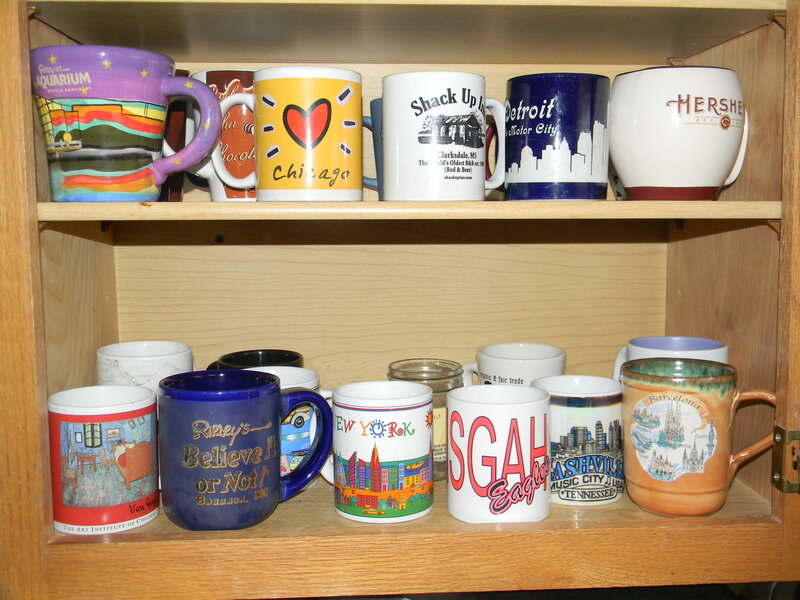 I have wonderful and bizarre of coffee mugs from all over the world because my kids and friends go to great places and always bring me a coffee mugs. They are more useful and cheaper than t-shirts. My most recent addition came from Portia Rico. Mary and Jack went there to surf last month and Jack got me a mug with mustached man(he looks kind of like Burt Reynolds) sitting on either a horse or donkey. Right now it’s sitting in the cabinet next to a mug with the presidential seal and a picture of Socks the Cat. Mary gave me that one for Christmas last year along with a pair of Toms. She was working at the Clinton Foundation so everything in the gift shop was fifty percent off. Jack and I took Lex to Graceland so I have a mug with Nixon and Elvis shaking hands. One of my favorites is from Fox Pass Pottery. When Lex was born Barbara and Jim Larkin (legendary artists) made her a cup with her name and a blue rocking horse. My best buddy Amelia brought me a mug with lots of tribal salmon and birds swimming around from Alaska. There’s a goofy leopard print mug with a cheetah head handle. Alex gave it to me when we were dating. It’s weird. I’ve got a Henry VII mug from London, mugs from Barcelona, Chicago, Nashville and the Outter Banks of North Carolina, New York and Detroit cause Alex was born and raised on Motown and there’s pirate mug from Daytona. I love my Shack Up mug from Mississippi. There were share-cropper shacks in the Delta but I think somebody famous like Morgan Freeman turned them into little blues cottages. Oh, and one of the best is from St. Louis. It has a big picture of the Arch of course. Amelia and I took Mary up there for college. Mary told everybody we were both “her moms,” so everyone we met thought we were a nice gay couple. Mary stayed in St. Louis for a few months then ran off with a guy who’s e-mail address was “Toker 69”. That’s what I think about every time I use that mug. There’s Pisgha, Alabama home of the Eagles. Pisgha is Amelia’s home town and it’s really fun to say out loud. The best for coffee is a big blue mug Lex got me from the Ripley’s Museum in Branson. 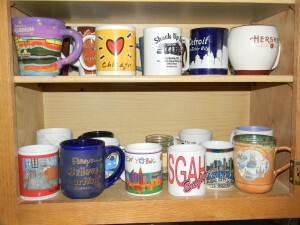 There’s only one rule about coffee mugs in Hampoland. We have an old cheap cup with cows. Twenty years ago when Mary and Jack were little, we had an entire set of cow dishes. Now there’s just one cup left with a momma cow and her baby. It’s called the “Cow Cup” and you’re only allowed to drink milk from the Cow Cup. If you try to pour juice in the Cow Cup everybody in the house will yell at you. Even Lexie and Sandor’s friends know not to put soda in the Cow Cup. So come on over any time. Ask for something to drink and you’ll probably get a great story along with your beverage. Where Did All My Families’ Money Go? Last night my daughter, who is sixteen, asked me what happened to all my family money. She knows, when I was little my family was pretty close to being rich. We were in the neighborhood. We didn’t have “old money” like the Kennedy’s or Rockefeller s But we lived well, very very well. I went to private schools. We had memberships in all the golf and tennis clubs in Hot Springs, Arkansas and Boca Raton, Florida. We always had maids and even took them on vacation so my mom didn’t have to watch me all the time. I took English horseback riding lessons so I could compete in dressage and we had a reserved box at the Boca Raton Polo Club. I had a boat when I was 13 . I was a debutante and traveled to Europe several times before I was 21. We had a place on the lake and my grandmother’s big family house on Prospect Avenue in Hot Springs. These days my husband and I work a lot of hours every week to hang on to our five acres and home. The house is falling down. Sometimes we have a couple thousand dollars in the bank, sometimes, when one of the kids needs an extra 100 dollars it’s hard to scrape it up. We manage to go on vacation (to Gulf Shores) every five years. We don’t have any money and we don’t have box seats to the polo matches. So, what happened to all the money. It’s that same sad story I write about sometimes. But there’s a happy ending, so hang in there. When I was sixteen my father, who was 51 and my brother Jack who was 24 , both died tragically just two weeks apart. My mom was a CPA, but she was so grief stricken and paralyzed with pain she could function. She made bad investment, then liquidated assets to make more bad investment. She wasn’t able to pay attention to the paperwork required by life and the IRS. And all the money was gone in five or six years. Bottom line…the IRS got most of it. Here’s what I remember about my life when I had money. There was a lot of fighting. The people I loved the most were always angry at each other. My oldest brother, my dad and mom were constantly in the throes of battle. Everybody loved me and took care of me, but I remember hiding in my room crying because of all the screaming and arguing …and it all generally revolved around my brother’s behavior when he was a teenager , he did a lot of really bad stuff….and money. Here’s what is true about our life today. We are here in Hampoland and we love each other. We play and joke and tease. We call each other “poop face” and “buckethead”. Mary and Jack love to lick everybody’s face when we are taking pictures. We have secret jokes and hand shakes. And we call ourselves “Team Us”. There is very rarely an argument or fight in the house. Because we are a member of our own team we all take care of each other. Sandor, the ten year old is sick right now and Lexie offered to make him tea or hot chocolate. We don’t have any money, we don’t go to polo matches, it’s a big damn deal when we get to go out to dinner. Sometimes we roll change and we’re late paying bills because we simply don’t have the money. My car has 237,000 miles on it. But all the kids go to college and we love each other. We don’t have a maid (Lord I need one) but we have joy and we have each other. Boy would I love to get my boat back and go on a vacation. But what we have now is so much better. If my kids argued all the time and stayed in their rooms all the time just to avoided us, I would be heartbroken. No amount of money could fix the heartbreak. I told Lexie she’ll have the education to build her own empire if that’s what she wants. Because we come from money she’ll fit right into society, if that’s what she wants. All the kids were raised as though they were semi-wealthy. They can walk into any room, shake hands and fit. But more importantly, all my kids know how to build their own “Hampoland”. 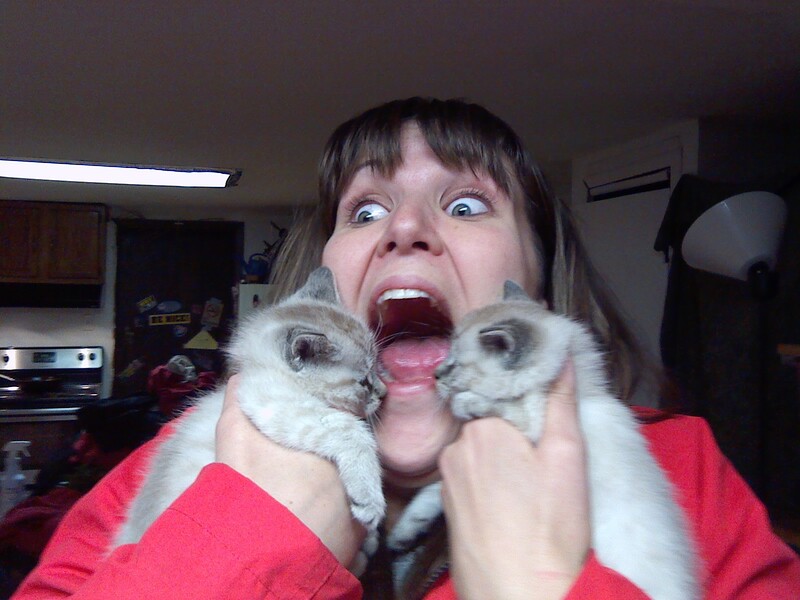 And when they do, I hope I’m there to lick some foreheads and call them all “poop face” cause that’s the good stuff. The tree is up and looks lovely. Yesterday we started hauling Christmastubs out of the shed and I realized there are several signs of Christmas in Hampoland. Some of them happen year after year others just started this year. 1. Before the first light is plugged in Alex and I start bartering and haggling. Is it a tinsel year? Is it a flashing light year? I hate both and he wants to make our tree flash like a gawdy landing strip. If Alex were allowed to decorate on his own, I promise you, our living room would look like an Elf threw up after eating Skittles. 2. We all look at Theo, our great big (100 pounds) old dog, and think about putting a Santa hat on him. He’d look so funny and cute with a Santa hat. But he give us “that look” and we know he will eat our arm and be embarrassed. 3. Lex will find our “Striper Angel”. She used to look elegant now she’s just tawdry and she has somehow outgrown her angel gown. Lex spins her around, “see, her but hangs out of her dress”. How did she gain wait in the Christmas box? 4.This year I bought a new lighted ornament. It’s a four foot lighted lizard, holding a Christmas package. 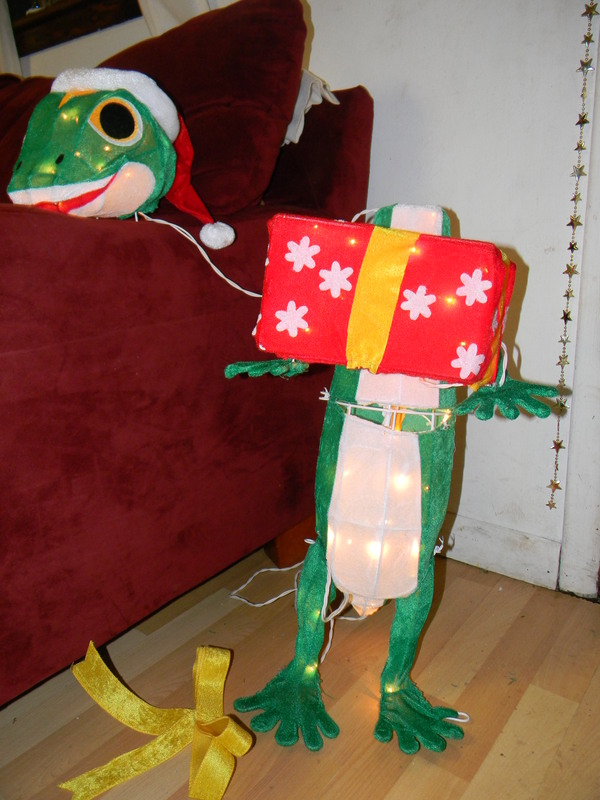 But he keeps falling over, then his head pops off so the new member of our Christmas family is a headless Gecko. I still like him. These are just a few of the signs of Christmas in Hampoland. I promise you, there will be more. I love the people who read hampoland.com. Last week I hit 100,000 page views. I find that utterly astonishing. I wrote a book 14 years ago, Invisible Branches, and I think it sold 600 copies. You can buy it on e-bay for $2.50 and sometimes I find copies at yard sales. I like it when the pages are worn and dog eared. that tells me people read my words. Ok, back to my deal with you, my invisible readers. Every three or four blogs you will notice I write about something even more bizarre than usual and these weird blog includes hyperlinks. I’m confessing to you, companies sometimes pay me to write blogs about their crap. Crazy right? My most recent offer came from BET.com. All I have to do is write about rap or hip hop and link it to BET.com. Why do they want a middle aged white lady in Arkansas to write about rap and hip hop? Beats me. I guess they are trying to expand them demographic. here’s what i know. I liked Lil’ John on Celebrity Apprentice. He was brilliant and funny and I liked his hair. Sometimes I turn the companies down. Yesterday they wanted me to write about a product that helps you quit smoking. But when I googled them there were hundreds of complaints. It was a quit smoking scam. I’m like everybody else. I really really really need to make a buck. But I don’t want you to feel as though I sold you down the river (I just realized that’s a racially insensitive figure of speech). Even when I do write a blog for a company I’ll try to make it at least moderately interesting and please don’t feel obligated to click on any link. The last thing I don’t want to turn you into “click whores”. So, for every three blogs I write You’ll probalby run into a “sponsored post”. Please don’t give up on me and thanks for reading and I love you. I write really short blogs. And I think that’s a good thing. I try to keep it short for two reasons. First, I don’t think most of you have a lot of free time to spend reading lengthy pieces from Hampoland. I’m smart buy my insights probably won’t change your life. And I know I’m crazy busy from 6am until 9:30pm so I think most of you are too. I sometimes find myself checking Sandor’s school work while breakfast is in the microwave and I’m blow drying my hair. I pluck my eyebrows at red lights. The second reason I try to keep my blogs short? I know I write about ridiculous, silly, stupid stuff. Lets see, my last five blogs were about gangsters, dead birds, Meatloaf and Donald Trump, bratty kids and my bad mood. Really how much time to do need to spent on these topics? So you see, I’m actually protecting you from waisting a lot of time reading about stupid stuff. That’s how much I love you. I’m going to admit right now that I rarely read entire newspaper stories or blogs. I read the first three paragraphs then kind of skim the rest. Generally I’m pretty interested, I just don’t have much time. Hopefully my doctor, lawyer and accountant have more patience when reading documents and text books. So get back on task right now , make a list of stuff you need to do, stay focused. And by the way, this blog was only 250 words. My 23 year old son, Jack, was here for a week and it was magnificent. He wrastled with his younger brother and taught him new drum riffs. He met Lexi’s new boyfriend and scared the poop out of him then teased Lexie till she disappeared into her room. He helped his dad cut and grill steaks and he hung out with me. He sat on the couch or layed down in my bed while I watched the morning news and drank coffee. He played new songs for me on the guitar and I actually cried. then, he and Mary, his 22 year old sister, even went and got tattoos together (how sweet is that?…gagging noises)And it was all beautiful. What’s weird though, is when we talk about growing up Hampo, which we do all the time cause it’s funny as Hell, Jack remembers some of the fights and tears that naturally come along with six people in one pretty small house. He remembers the year Mary came home after dropping out of college (she’s pre-med now). And he says Mary and I fought “all the time” that year. He remembers the angst(ok, he did write some bad and sad poetry when he was 14) and how hard it was when he and Mary were teenagers and didn’t get along for three years. Jack remembers bad teachers and tests grades, crying when we had to bury dead dogs that we loved all kinds of sad sad stuff. Me? Apparently I’m the dancing fool because I don’t remember anything unpleasant unless someone works super hard to remind me. If you looked in my brain I think it probably resembles an Easter Basket, lots of pretty colors, candy, Peeps and plastic grass. For the most part I only remember the joy and silliness. I remember laughing so hard with Mary and Jack in the car, that I had to pull over so I wouldn’t wreck. 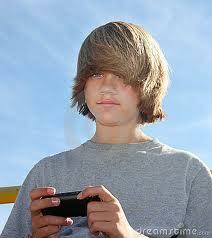 I remember Jack getting kicked out of school for having crazy hair. I remember Mary crying when the Pink Ranger left the Power Rangers and the Christmas Alex pawned his guns so we could afford gifts. But in my mind, all that is stunning and beautiful. Life has been a basket full of candy and Peeps. And I guess, with my skewed and misshapen memory, I’m the luckiest woman in the world. Yesterday, my daughter Mary, who is 22, and I took Sandor out to play tennis. I’ve always wanted a child to play tennis with and now my hopes lie with my youngest boy. As a pre-teen, Mary tried to play tennis, and several other sports, but they were all miserable and almost embarrassing failures. We laughed and had fun on the court but she was a beautiful, smart, spaz who refused to even try. Mary was the kid who hit the ball over the fence and into the parking lot over and over again. I considered buying a Golden Retriever so I could stop chasing balls. Or she made up excuses to stop playing, cramps in her legs, broken shoe laces, invisible ant bites. The truth was, Mary hated trying anything involving physical activity. She didn’t want to run, jump, swing or smack. (She liked swimming and could have been on the swim team but she was never willing to learn to dive. When she tried to dive she looked like a cartoon character and there was always that painful smacking sound as her face and belly hit the water.) Her lack of physical dexterity was not that big a deal and after a while I got over my need for a “jock daughter”. Since those days Mary has transformed herself. In high school she was convinced boys didn’t want smart girls, she was too tall, too big, and tried to make herself disappear. Then she got to college and discovered the truth, she’s stunning and men love her. She saw in herself what we’d seen all along and started dressing and acting like a magnificent creature rather than a excessively dowdy and frumpy used book seller. This semester she’s even taking ballet along with all her pre-med classes. Yesterday, on the tennis court, the transformed Mary showed up. 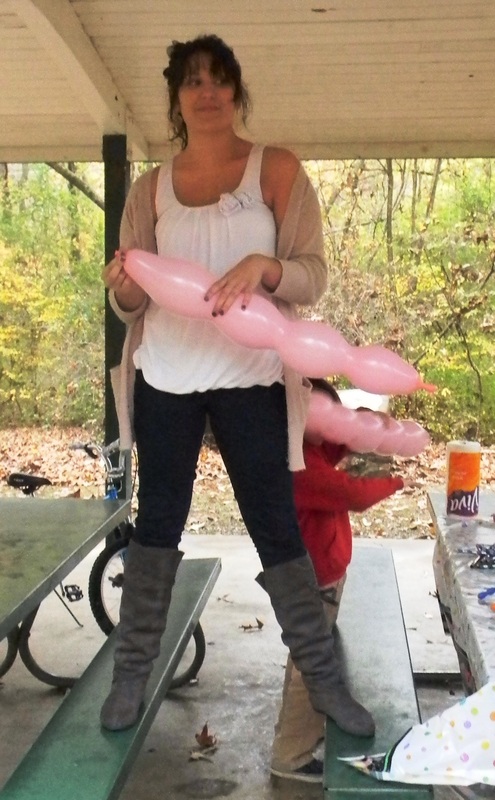 She was wearing Mary’s clothes, skinny jeans, knee high leather boots and an upscale pink hoodie. But when I hit the tennis ball to her she hit it back. What the hell? Then she did it again and again, as though it wasn’t a big deal at all. “Where’s Mary?” I asked. And she just laughed. After a few minutes I walked to the net, “Seriously, when did you learn to almost play tennis”. I was genuinely mystified. She just shrugged and smiled, her lip gloss sparkled in the sunlight. “”I quite caring what people thought and I stopped worrying about looking stupid. I can do all kinds of things I didn’t think I could”.